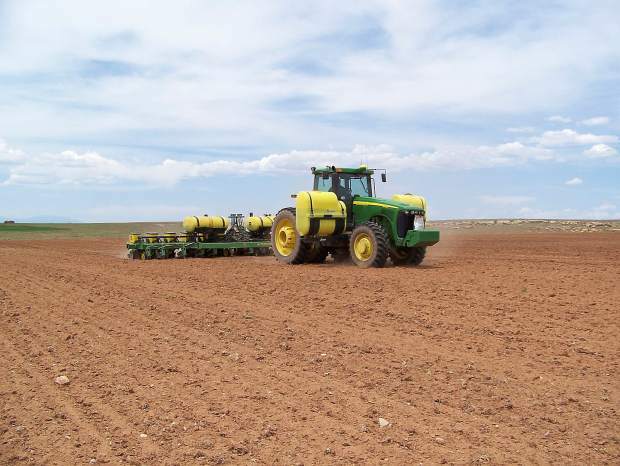 Story by Sam Waters | Ft. Collins, Colo.
Ute Mountain Farm and Ranch Enterprise use GPS and precision ag technologies in their equipment to maximize productivity. More than 40 percent of farmers in America are age 55 or older. The graying of the farm population has led to concerns about the long-term health of the agriculture industry in America. Since the trend over the last century has largely been to leave the farm and take a job in the city, some in the agriculture industry are concerned that the younger generations won’t feel inclined to take over the farm. However, a recent trend in agriculture may prevent that. Precision agriculture uses the latest technology to maximize farm productivity. Today’s tractors have the latest gadgets and gizmos similar to those you might see walking into a tech store. And it’s those technologies that are inspiring a younger generation to keep carrying the torch, or rather the pitchfork. “Hopefully one day I’ll still be here and the torch will be passed on to me and I will be able use what my mentors taught me and continue on,” Michael Vicenti said. Ute Mountain Farm and Ranch Enterprise is located in Towaoc, Colo. While founded by tribal members, the farm is relatively separated from the tribal community. It is located on the west side of the Sleeping Ute Mountain and the Ute Mountain tribal community is located on the east side of the mountain. Ute Mountain Farm and Ranch Enterprise has used precision agriculture technologies for several years now. On the farm they help educate tribal members about agriculture and provide jobs to both tribal and non-tribal members. “As a student, this is the best classroom,” Vicenti said. Colorado State University student and Ute Mountain tribal member, Vicenti first learned about the farm and ranch enterprise while in college. Although he grew up in the tribal community, Vicenti never knew about the farm until he was introduced to Paul Evans, manager of the farm, who was looking for intern to help with the Global Information Systems program for the farm and ranch enterprise. “I was able to see the whole aspect of the farm and it was my first time seeing it. It was so big I didn’t think that the Ute Mountain tribe had a place like this,” Vicenti said. Vicenti’s job during his internship was to map out the entire farm, locate the center point of each field and map all of the canal systems. The farm then utilized that information to maximize productivity. After completing his internship, Vicenti was not as enthusiastic about agriculture. He believed that it was somewhat of a dead end job. But after being hired back on the farm as an irrigator after a year of severe drought, he says he “eat[s] those words every day.” Learning how to use the new technologies and experience this new form of agriculture got Vicenti excited about agriculture and kept him working for the farm and ranch.